Saudi Arabia possesses a unique and interesting Middle Eastern culture for candidates to explore while they gain personal and professional experience. With so many recreational and cultural opportunities available, Saudi Arabia is a perfect match for all candidates interested in a brand new international living experience! While living in KSA, you have the daily option to either indulge in the delicious local cuisine at various restaurants or stick to more familiar food items. The local grocery stores all carry western style food items and are within ten minutes of instructor placement locations. If you choose to explore the grocery stores, expect food prices to be slightly less expensive than you would find in the United States. Coffee lovers need to look no further than the traditional coffeehouses of Saudi Arabia. According to the Saudi Arabian Cultural Mission, serving coffee (gahwa) is a sign of hospitality and generosity. In addition to local cuisine, Saudi Arabia has seen a massive increase in the availability of global cuisines and international restaurants. There is a surplus of Italian, French, Indian, American, Chinese, and Japanese restaurants within larger cities, as well as popular fast food chains! 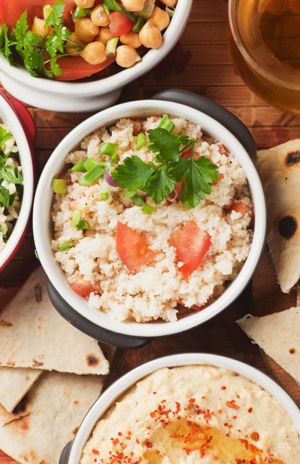 If you’re more adventurous with your appetite, you can try traditional Saudi dishes in places spread around the cities. Take a chance and try the most loved dish of locals, the “Mathloutha” or the “Mandi“. A popular and delicious Saudi speciality worth trying is a dish called “Kultra”, traditionally made from chicken or lamb! In line with Islamic cultural law, consuming pork and drinking alcoholic beverages are prohibited in public. You are free however to indulge in the privacy of western compounds. Riyadh and other cities in the Kingdom are full of exciting recreational facilities and excursions for both locals and expats! Most placement locations feature opportunities to join health clubs, sporting clubs, or organized excursion groups. There are tons of exciting opportunities to explore your new location including: treks in the Desert, camping out under the nascent clear sky, a visit to the camel market called “Souq“, shopping in the world famous malls or the old antique market, internationally regarded coral reef diving, the King’s Cup, and group dining activities. If you are a video games enthusiast you can play in the Malls or buy your own consoles; all types are available. There are incredible places to travel to and enjoy within Saudi Arabia as well, such as Malayan Saleh in the North, the fields of volcanic sprouts, the Empty Quarter in the East, and a water hole formed by fallen space debris. The southern province of Saudi Arabia has exceptional natural scenery and tourist attractions as well. In the Eastern Province you can top up all this with dip in the sea or just relax out on the beach. You are free to travel in which ever manner you like including on road or by air, rental car, or use of the public transport. Whatever your interests, Saudi Arabia has an exciting solution to boredom! 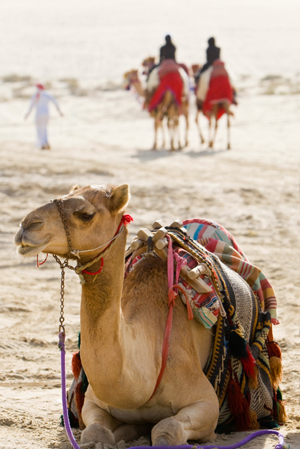 Saudi Arabia has an exciting and diverse culture for foreigners to explore and immerse themselves in! During this experience, it is important to keep in mind that cultures vary greatly from one another, and you might initially struggle to adjust to your new surroundings. Cultural norms concerning conservative dress codes and social interaction can be confusing at first, but foreigners can easily adjust in order to respectfully merge with the local community. The educational community of students and other TEFL instructors is also very helpful for dealing with culture shock. The local community is quite familiar with other cultures, compliments of movies and satellite channels, and will react positively if you show a genuine and respectful interest in learning about their culture. Most native people that you meet are very enthusiastic about making friends with foreigners and crave to practice their English skills- especially with a native. Part of teaching abroad is having an opportunity to experience something brand new and alternative to your current lifestyle. Saudi Arabia is one of the safest places to live. Regulations and laws on criminal behaviour are stringent and therefore you are as safe here as in any small town back home. Crime rate in Saudi Arabia is one of the lowest in the world, specifically concerning serious crime such as homicide, robbery, gang activity, and organized crime. There are burglaries or carjacking as in any city, but that is limited to certain area which you are advised to avoid. In general, a single woman can walk in big cities like Jeddah, Riyadh, Dammam, and Abha without fear of assault.